Mattel is making the most of its DC licence and existing DC Universe Classics pieces by releasing companion lines to the main DCUC line. The Batman Legacy line is most likely designed for brand recognition and targeted at Mom & Dad buyers, but there’s definitely something in it for us collectors. Tonight I’m looking at Batman Legacy Wave One , which consists of Batman, Joker and Mr Freeze. On the surface, this might just seem, like a set of repaints of existing figures, but there’s a bit more in it than that. For many, this will be the first chance to get Mr Freeze in this line, and these new versions of Batman and Joker both have an edge of difference which increases their appeal. I tend to fatigue quickly of characters who are constantly repeated in lines (I’m looking at you, Marvel Universe Wolverine...), but the DCUC Batman is a character I will always entertain a new version of. After appreciating the Batman Legacy version for awhile, I think this may be my favourite Batman in the line. The main reason I really like this is the facial expression. This angry, gritted teeth look really suits Bats and lifts the overall impact of the whole piece. It creates some interesting possibilities for posing and battle scenes. In addition, Batman has two closed fists which is a nice change and again provides a different look for a Gotham action display. The other thing that sets this new Batman apart is some rather significant pouch enhancements. 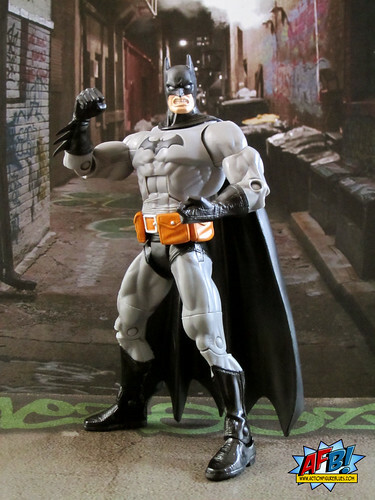 I’ve never been a big fan of Batman with giant pouches - it seems counter-intuitive to the idea of the utility belt that can hold everything in tiny little capsules. 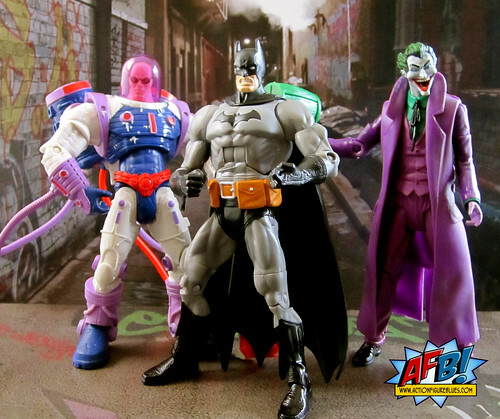 The Joker in this line has had some more significant tweaks from its DCUC Wave 10 counterpart. This is billed as a “Golden Age” Joker, and it’s actually a pretty good stab at one. The headsculpt is new, and captures some elements of the Joker’s early look, particularly the shorter, wider head that he was sometimes drawn as having. His hair is also more in the vein of his golden age look, and his mouth is a bit wider and toothier. It’s a nice effort at something different. The real gem, though, is his trenchcoat. It’s the same mold as The Question, so it’s not new tooling, but that doesn’t mean it’s not a great looking. I really do prefer the trenchcoated Joker, so all up this is very worthy addition to the DCUC line, and the new headsculpt on top of it makes it a great “new” piece. 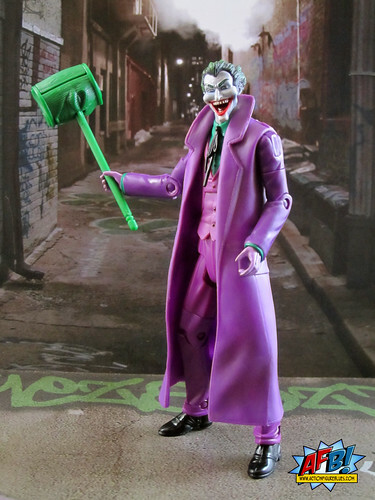 Joker also has his trademark mallet, which is light enough for him to hold at different angles, and a stack of playing cards, which I inadvertently threw away with the packaging. I haven’t cried any tears over them, they would have ended up at the bottom of one of my Black Hole Box of Accessories anyway. For a few reasons, Mr Freeze is my pick of the bunch. 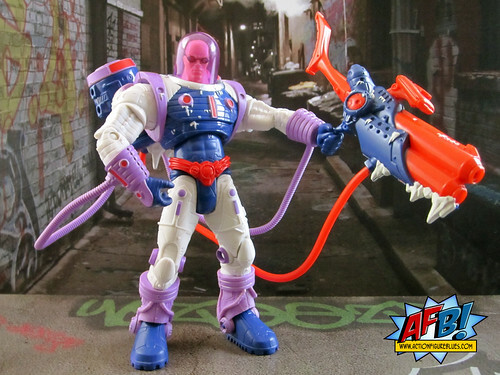 The original Mr Freeze from the DC Superheroes line is very hard to get hold of for a reasonable price these days, especially if you’re trying to find it carded. I missed the DCSH figure and can’t say I’m invested enough in the character to pay eBay prices for him, so this reissue is welcome for me. This Mr Freeze is billed as a “Silver Age” version, but I can’t find evidence of him looking like this in the comics - please post a link below if you know of one! His first appearance (1959) gear, back when he was Mr Zero, was a red and green fabric deal with clear helmet, which would have been exciting variant but would have required a completely different sculpt. I asked the folks at the AFB Facebook Page where they thought this colour scheme came from, and the response was that it’s an homage to the Super Powers Mr Freeze version. I can see this to a degree, although that version didn’t have the pink and red elements. I’m just looking at as a fun repaint unless someone shows me its comic reference. I don’t mind the bright colour combination and the new colours certainly add some fun! I can only only judge by comparing to pics of the original figure, but I can’t see that much re-tooling has been done, although on the final product his hoses are attached to his wrists, which is different both from the DCSH version and the promo shots for this figure. While the handle for his amazingly large gun is amazingly thin, and a tad hard for him to hold, there are some great poses to be found once you get the correct grip and angle. There’s a very pleasing amount of articulation for a figure with this amount of armor and extras. He might be a tad psychedelic, but he’s a pretty groovy toy too! Nifty, I might have to get the Joker. Rather nice looking figures and i just might have to get that Batman figure. I agree with fishmilkshake, Joker's the standout of this wave. I'll have to agree that Mr Freeze is actually the pick of the bunch. I got him too! There are a few differences from this version and the DCSH one, the biggest of which is that he's got leg hinges. I need to look at it a lil' more closely--I'll be reviewing the figure soon too! picked up the last Joker and 2nd last Batman off the pegs. many Mr.Freezies at my comicbook shop. good stuff. personally I be switching Batman head for a bot crazy lookin one.